Happy Friday Y'all! So yesterday was the Apricot Lane Blogger Event here in Provo and that was fun to go to and see some old friends and meet some new ones! This is the outfit I wore to go! A lot of y'all might not think of JCPenny when you want to go shopping but you should seriously check it out! I got this dress there for only $19!! I'm obsessed! Its no comfy and theres so many different ways to wear it! When I was shopping there I found so many cute things, I could have spent tons of money there but just allowed myself a couple things, but I'm so glad I bought this dress. I love how its almost a maxi but not quite! 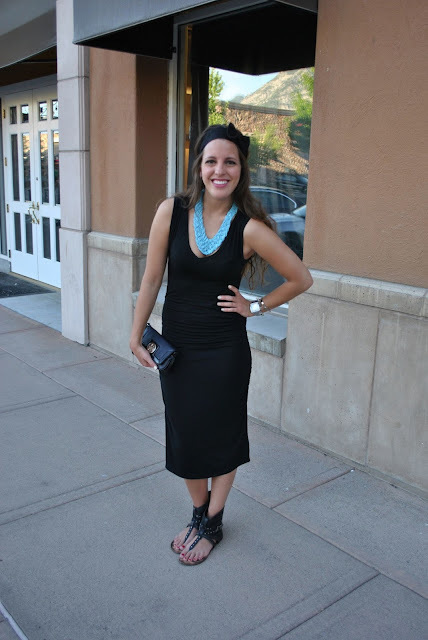 I kept this look simple and had most black accessories except for my pop of blue with my statement necklace. Keep reading below for a pretty amazing giveaway!!! And now for an AWESOME Giveaway!!! I teamed up with 18 other bloggers to giveaway a $300 J. Crew Gift Card! How awesome is that?! One lucky reader will be getting a legit shopping spree! Make sure to check out these other bloggers and enter the giveaway! They're seriously the greatest! *Giveaway will run until July 8th and is open to readers in the US and Canada only. Erin I am so excited to!! I love your blog! Sad I didn't see you yesterday at AL! And seriously, I went to JCPenney for the first time in years, and it was definitely impressed. I feel like they've stepped up their game recently! they totally have stepped up their game! i love a lot of their stuff! but i hope there is another blogger meet up soon because its a bummer i didn't meet you!! Love your blog! So excited to team up with an amazing blogger! You look amazing!! love your necklace! !